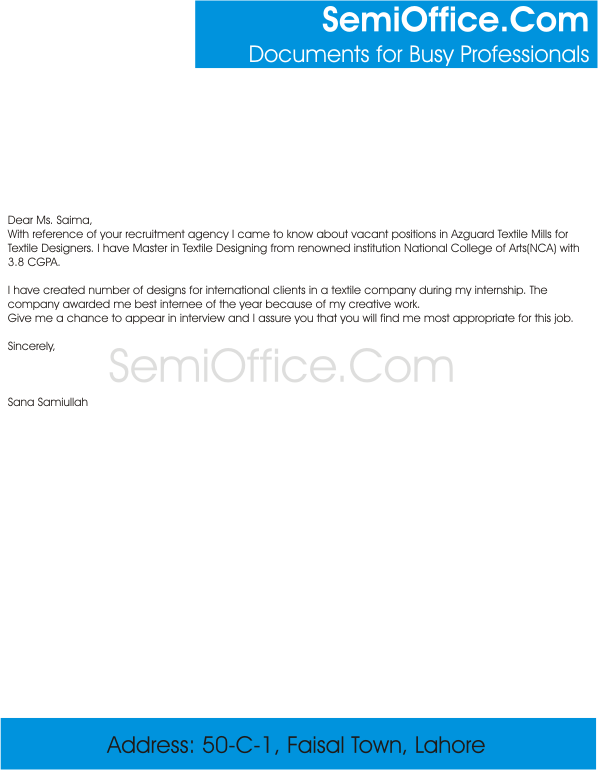 Sample job application for textile designers, garments designers available for free download. Sample application for the post of bed sheet designers, pillow designer, curtain designers, sofa designers and carpet designers. With reference of your recruitment agency I came to know about vacant positions in Azguard Textile Mills for Textile Designers. I have Master in Textile Designing from renowned institution National College of Arts(NCA) with 3.8 CG PA. I have created number of designs for international clients in a textile company during my internship. The company awarded me best internee of the year because of my creative work. Please give me a chance to appear in interview and I assure you that you will find me most appropriate for this job. I came to know about the vacancy of textile designer in your reputed firm through some reliable sources. It would be a pleasure for me to get a chance for applying within your organization as I have experience and qualification in the same field. I have done Masters in Textile and fabric designing from University Of Punjab. My final result is good enough to show my academic session record of my degree. I have experience of internship in various recognized institutions. Currently, I am working as a designer in Al-Karam Fabrics and proven myself due to my hard work and creativity. I have been looking forward to better opportunities in future and to work in organizations like yours to enhance my skills and show my working capabilities. Enclosure contains my Resume along with documents for further details. I would definitely like you to consider me eligible for the post. It would be tremendous chance for me to be here. I shall be waiting for your pleasing response.